There’s an old saying about the web – well, not that old considering the relatively new nature of the digital world in the grand scheme of things – that suggests not everything you read on the Internet can be considered trustworthy. 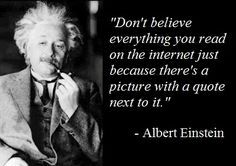 Whether you attribute this wisdom to Albert Einstein, Abraham Lincoln, or just let it stand by itself as a pillar of common sense, everyone from The Week’s Chris Gayomali and his friendly reminder concerning the veracity of many digital outlets to marketing professionals from different companies suggest that it might be worthwhile to spend a little more time taking things on the web with a grain of salt. This is good advice every SEO writing services expert will tell you. With this in mind, let’s spend a few minutes digging into five supposed “truths” found within the world of search engine optimization (SEO) and why it just might be time to rethink your stance on these SEO myths. From here, you’ll be ready to move forward with the development and optimization of your site while others are stuck wrestling with facts, figures, and tactics that simply don’t hold much value when you take a closer look. First up on the agenda is dispelling the idea that SEO is a “quick fix.” As Amanda Clark of Business 2 Community points out, there’s generally only two reasons why someone is willing to sell SEO as an overnight sensation – either you’re getting scammed or this so-called expert is willing to utilize underhanded tactics that are sure to bring down the wrath of Google. Proper SEO can deliver a fast turnaround in some scenarios, but the truth of the matter is that this practice requires a long-term approach that rewards patience and builds the quality of your page over time. Additionally, Clark goes on to explain that there’s a misguided notion floating around the web that content marketing and certain SEO tactics have to stand in opposition of one another. Actually, this couldn’t be farther from what Google and the other search engine giants want from brands and marketers. As this industry shifts farther and farther away from keyword stuffing and other shady tactics, compelling, customer-driven content that offers up real value and entertainment serves as the focal point of the ever-increasing overlap between these two practices. Having a website with words on the screen is good enough for at least some sort of SEO benefit, right? While that seems like a logical assumption, Search Engine Watch’s Kristine Schachinger notes that this mentality embodies a myth that endangers the viability of your online presence. Outside of a few highly unique cases, expecting your customers to come running to your page – even if it does already have great content on-site – just isn’t a realistic approach. If you truly want to get seen by the people that matter most to your brand, having great content is step one, and building relevant and influential links that support these offerings comes next. Another key point offered up by Schachinger covers the concept that page ranking and positioning only matters based on tiers. For instance, the idea that making the bottom of the second page on a certain search term or query provides the same benefit as being at the top of the same selection falls firmly into the parameters of this myth. Unfortunately for those who subscribe to this line of thought, the numbers tell a different story. Each unique spot up your page moves – especially in the top 13 results – offers a massive boost to your reach and potential. Sure, not every browsing consumer responds to favorable rankings exactly the same, but it’s more than safe to say that the higher up you stand on any response page, and not just being content to make it this far in the first place, goes a long way toward increasing your return on your SEO investment. At this point you’re probably thinking that the myth surrounding the interaction between social media and SEO has at least a little going for it. After all, Google doesn’t even count Facebook likes or retweets when it comes to page rankings! While this is definitely true, Cyrus Shepard of The Moz Blog points out that it doesn’t mean your social media presence has zero impact on your SEO operations. Think of it this way: Social media might not directly play into increasing your position with Google and the rest of the search engine world, but that doesn’t mean it can’t have some extremely powerful secondary affects. By being active on social media, you improve the distribution of your content via shares, likes, and favorites, as well help boost the discovery and indexation of these posts. This in turn works as an organic form of link building – something that is definitely worth your time. Obviously, the Internet is a valuable source for both research and entertainment, but at the end of the day it’s susceptible to misinformation and misguided “truths” just like any other form of media. However, with this realization leading the way, and a willingness to keep asking questions from whoever is handling your SEO operations, you’ll be more than ready to sift through the myths and get the most out of your page and content optimization endeavors.